September 23, 2019 is to be like no other in the life of mankind. On this day we will celebrate one special day that will last a lifetime. A harmonious day with tremendous meaning and paroxysm. This day will finally bless us to feel the feeling of major accomplishment and fortitude forever. The day, the fourth Monday in September will be known as arrogressive™ Day! arrogressive™ is not just a word, but also a behavior. arrogressive™ behavior exemplifies individuals with the wisdom, knowledge, energy, and fortitude to set forth the attitude of “I must maximize my potential, despite any obstacles.” This “can do” lifestyle that has been in existence since Biblical times and is now defined by this powerful word. Love, compassion and caring are also major ingredients. Now is the time for others to step outside of themselves and say, “It’s ok to label me arrogressive™...” If ever there is a time for all to see what is needed today, it is now. The secret to success is out of the bottle. arrogressive™ behavior is the key to individual accomplishments for the good of all persons, places and things, regardless of life’s obstacles. Only exceptional ones can wear this title, partially defined is non defined. Celebrate this September 23, 2019 and every calendar fourth Monday of September in the future as arrogressive™ Day! EDUCATIONAL NEXT LEVEL FUNDING, INC. is a 501(c)(3) nonprofit. arrogressive™ is a registered trademark of A2Z IMPRINTS, INC.
TM 2006 A2Z IMPRINTS, INC., all rights reserved. 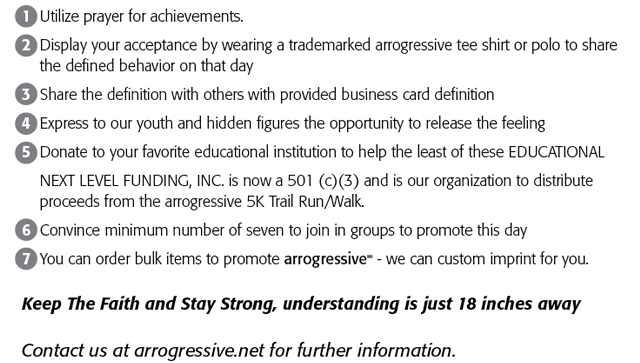 “arrogressive” is a registered trademark of A2Z IMPRINTS, INC.